They don’t call it the ‘Red Eye’ for nothing. We left Salt Lake for New York on Thursday at 11:00pm. Try as hard as I could I was completely unable to sleep on the plane. I don’t get it, I mean trains have beds so why not replace all the seats on planes with Lazy-boy Recliners? That way you could really stretch out and get comfortable! When we landed at JFK Airport at 5:30 Friday morning I was so tired I just shuffled and moaned liked a zombie. The Hotel Pennsylvania would not let us check in until 3:00 so we went and bought tickets for a Broadway show which we planned on seeing on Saturday. We also made our way over to the Expo where I picked up my runners packet. The security was super extra tight and I have to assume it was because of the attack at the Boston Marathon earlier this year. I guess they wanted to make sure the same thing didn’t happen here. With all the walking New Yorkers do they must be the healthiest people in the country. I usually don’t run or exercise 2 days before a race but I think we probably walked a full marathon running all over town. Later back at the hotel and unlike on the plane I finally learned how to sleep sitting up. We were in the lobby waiting for our room to become available and apparently I just keeled over on the bench and fell fast asleep. 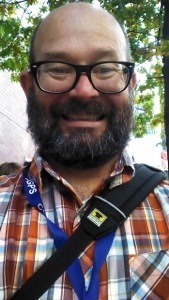 After checking into our room we had arranged for my Cousin, Brian Pennington to meet us. He lives in Brooklyn and since we hadn’t seen each other since we were both kids we were excited to meet up again and talk about old times. 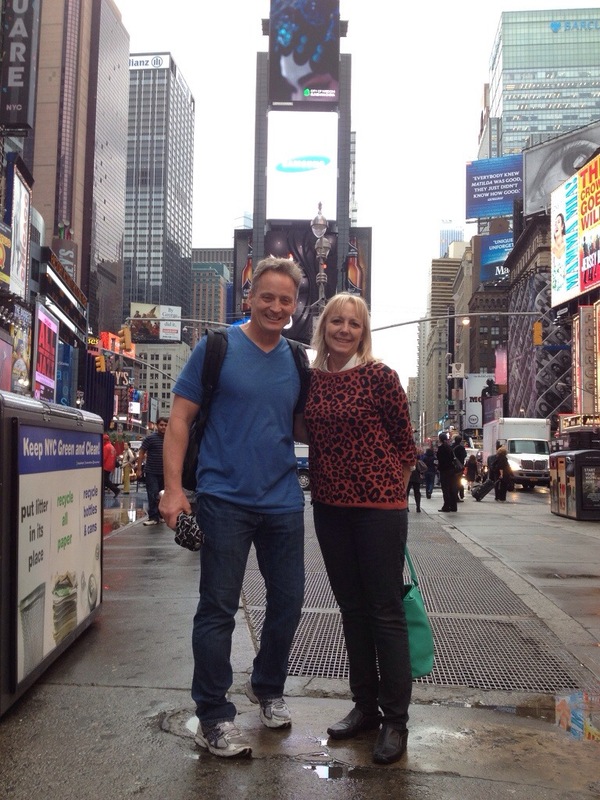 He took us around the town and even showed us how to use the Subway. Lynette and I were both scared of this strange form of transportation, probably because of all the movies we’d seen depicting it as scary and unsafe. Nothing is further from the truth. It was fast, efficient, cheap and very safe. Yo, you wanna sleep on our streets….no problem, but you wanna pee on the bridges….you gotta big problem! Bodda Bing, bodda boom! podium and delivered our one and only instruction…’no peeing on the bridges!’ I would have thought 5 minutes on this subject was enough to cover everything but I was wrong. The warning went on for about 10 or 15 minutes total. New York is very serious about their bridges. I didn’t even need to go but after hearing the word ‘pee’ 20 times and listening to the rushing water underneath the the bridge I soon found myself needing to go! The course was really fun. It was a point to point line stretching from Stanton Island over 5 bridges and through all 5 borrows. All the roads were shut down so we were very safe through out the entire race. The crowds were great and there were plenty of water stations and portable potties. The air was filled with excitement and everyone was in a great mood. This city put on the best marathon I have been to. At about mile 10 all the runners had to funnel tightly together to pass over a small bridge. I noticed two dark handsome, model type men speaking in Italian running on my left. They said they were from Milan Italy and told me they were wanting to be more American. They asked me if I could give them a few tips on how to fit in a little better while they were here. Wow did they pick the right guy to teach them some American coolness. I told them I was from Utah where the cowboys live. 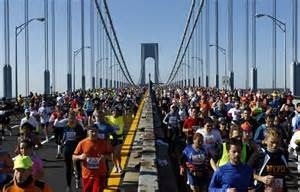 With my great knowledge of trend setting vernacular …….., I had them repeat after me ‘Yipee Eye Ki Yay’ followed by the ever popular ‘YEEE HA’, Soon all the runners on the bridge were chanting my ‘what every cool person says to sound more American’ phrase. Some where in Italy there is group of ridiculously handsome runners thinking they are really cool Americans shouting Yipee Eye Ki Yay, YEEE HA! When the race began it was a cold 38 degrees outside but after just an hour it had already warmed up to 50 so as the mercury began to rise the extra clothes started to come off. As thousands of runners stripped there jackets and hats and gloves off the road became very dangerous. I saw several people trip and fall over piles of clothing. I nearly fell myself also the streets in front of the water stations were soaking wet and very slippery but the worst and most dangerous part of the coarse came at about mile 18 where they gave out bananas. Most runners would take one or two bites and then throw them on the road. 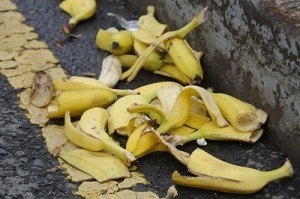 People were slipping left and right all around me on banana peels. It looked like an old Vaudeville comedy act. I can’t say enough about Achilles International. 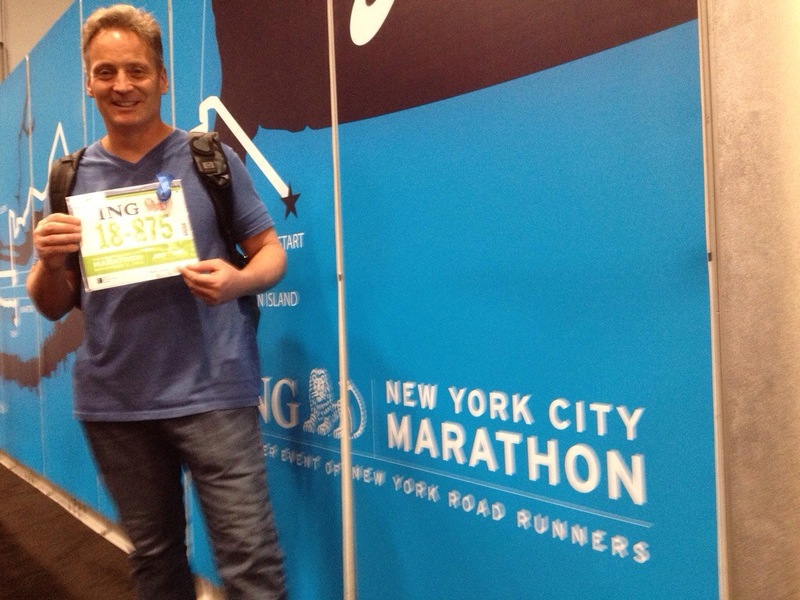 They helped get me into this prestigious marathon and even paid the race fees. They do so much for so many people with various disabilities. They really took care of us. The Achilles members and volunteers are some of the greatest people I’ve ever met. Heroes everyone of them. I am so proud and honored to be numbered among them. 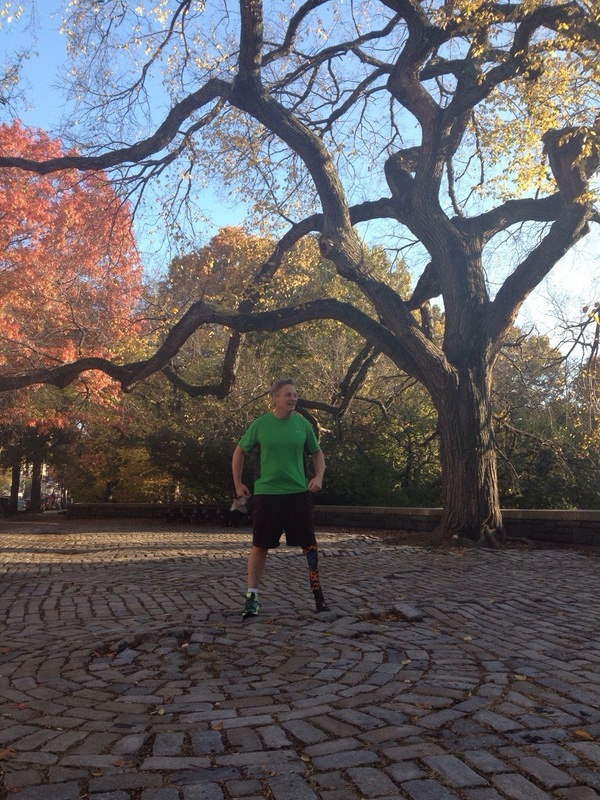 Thanks to Achilles and New York City! 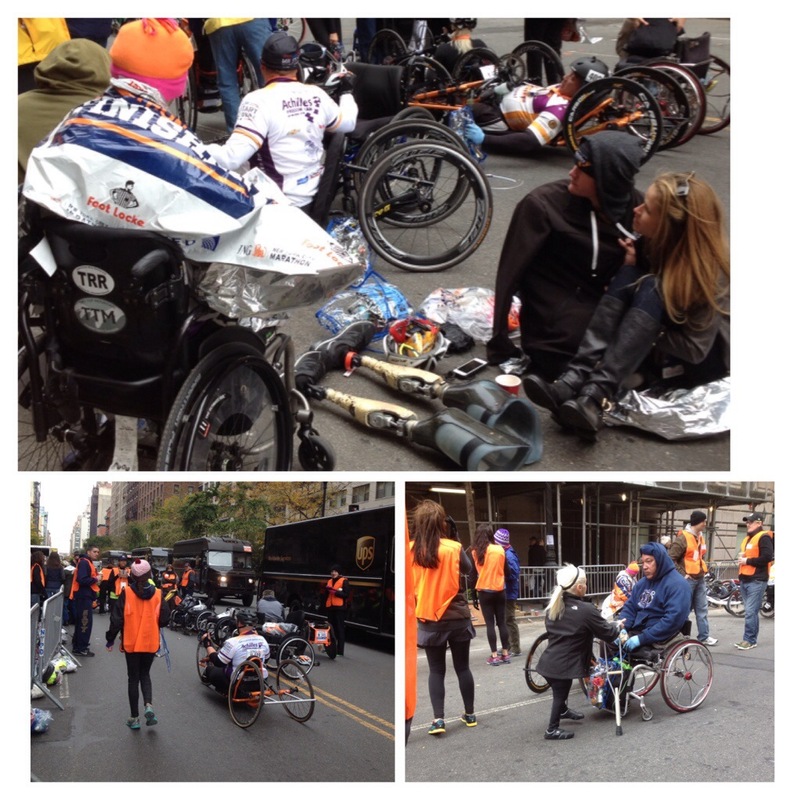 Prior to the starting of the race all the diabled runners met at the Achilles tent at the starting line. 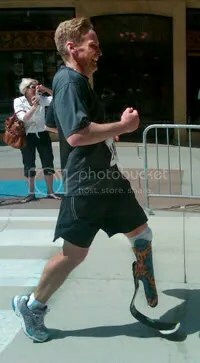 I started scanning the group for fellow prosthetic runners since they are few and far between. As I was looking around there was two older women sitting there all by themselves with plenty of empty seats at their table so I decided to invite myself to sit with them. They were wonderfully interesting. It turned out they were sisters and had been running the NY Marathon every year for over 20 years. They were so fun and just so sweet. 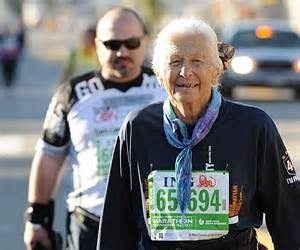 The next day I heard on the news that the Oldest Female runner in the marathon had passed away. I saw a picture of her and realized the little lady I talked to was Joy Johnson. She was quoted to say to her family “She wanted to die with her running shoes on”, and she did. 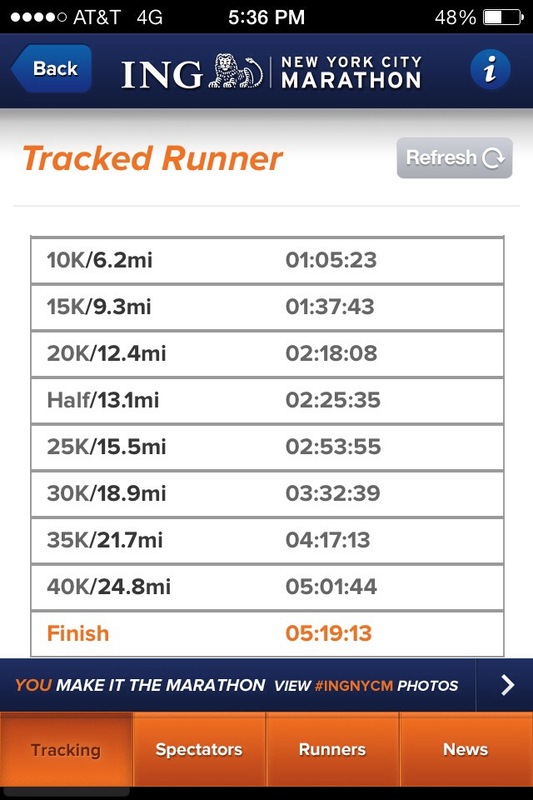 She apparently fell and hit her head Sunday around the 20-mile mark of the marathon. But she got up and completed the race — for the 25th consecutive time. Some may think she was crazy for running a marathon in her eighties. I love that she lived her life fully. 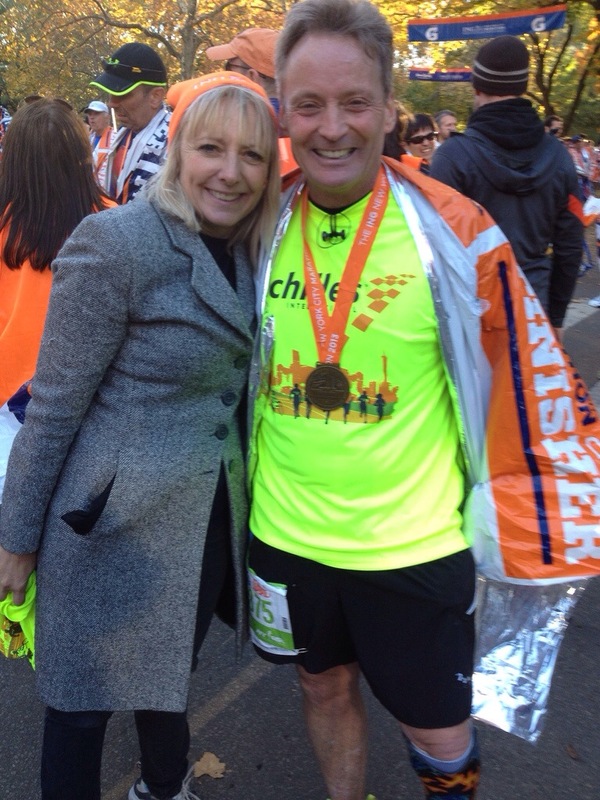 I am grateful for the many experiences and people I met doing the New york marathon. Every race brings me to an appreciation of all I have been blessed with and to the knowledge of the many wonderful people in this world. 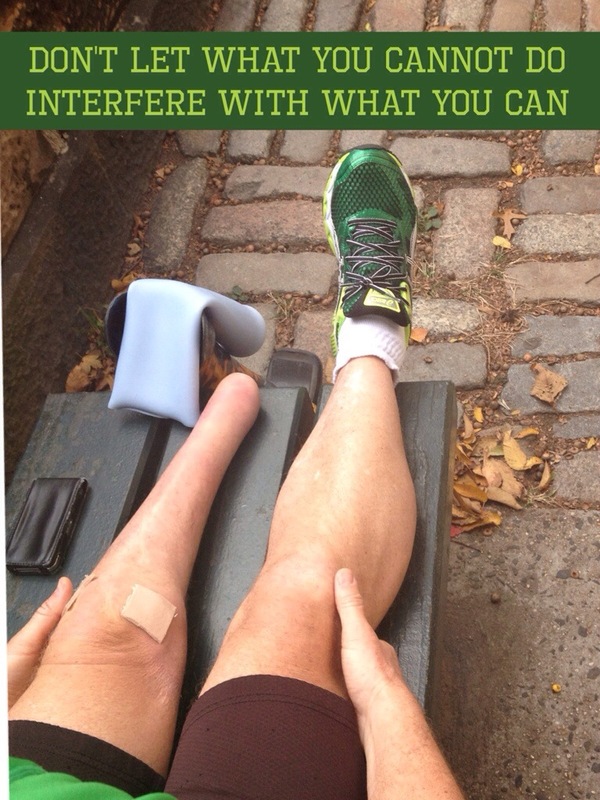 Posted in 50/50 Marathon Club, Marathons, New York, Prosthetic LegTagged Achilles international, bananna peels, blue dragon prosthetic leg, challenged runners, joy johnson, mental-health, moblily impaired, new york marathon, new york marathon peels, overcoming obsticals, prosthetic runners, prosthetic runners new hork marathon, prosthetic running, road hazards new york marathon, Tim Hurst, winter runningBookmark the permalink.